We are living in the most peaceful time in history. There is less violence in the world today, on average per person, than at any other period. Not only that, but rates of violence in the United States are lower now than they have ever been. Oklahoma is almost certainly no exception. Pinker does a wonderful job in the first half of his book demonstrating that violence genuinely has declined throughout history. The key to understanding Pinker’s case is to keep in mind that he isn’t talking about actual incidents of violence, which very well could have increased, but to look at rates of violence compared against the overall population. Incidents of violence per 100,000 people has plummeted to all-time historical lows. While some people have tried to argue that Pinker may be mistaken in the long-term, his argument that violence declined in the last half of the twentieth century, particularly in Western democracies, goes undisputed. In the United States, there was a peak in the 1960s, followed by a steady decline in all kinds of violence since. In just the last twenty years, the United States has seen the rate of violence decline so much that the incidence drops have outpaced population growth, which is to say violence has declined by over 37 percent at the same time that the population has grown by over 22 percent. If you combine the numbers, the actual rate of violent crimes per 100,000 people in the United States has dropped by nearly half in just twenty years. I’m not going to try to argue for or against Pinker’s explanations to why this has occurred. I’m not qualified to do so. What I’m interested in is how Oklahoma holds up under this trend, and whether Pinker’s explanations might shed light on the areas where Oklahoma differs from other parts of the United States and the broader world. Oklahoma has not bucked the national trend. It also has become less violent in the last twenty years. In 1993, there were 20,498 violent crimes reported in Oklahoma. That number peaked in 1995 at 21,748. Since then, the number of reported violent crimes dropped to 17,630 in 2011. At the same time, Oklahoma’s population grew. There may be no census data for 1993, but if you go back to 1990, the state population was estimated at 3,145,585 million people. In 2010 it had grown to 3,751,351 million people. That’s an increase of over 19 percent. If you combine violent crime and population numbers, the Oklahoma violent crime rate per 100,000 dropped by more than 25 percent between the early 1990s and 2010. This may seem significant, but the bad news is that Oklahoma has not kept up with national trends. For example, when Oklahoma’s violent crime rate peaked in 1995, at something like 660 incidents per 100,000 people, it was still below the national average of 684.5 incidents. While the Oklahoma and national rates have dropped, Oklahoma has not keep pace with the overall decline in rates of violence. In 2010, Oklahoma’s violent crime rate was 478 incidents per 100,000 people, while the national average was down to 404.5 incidents. 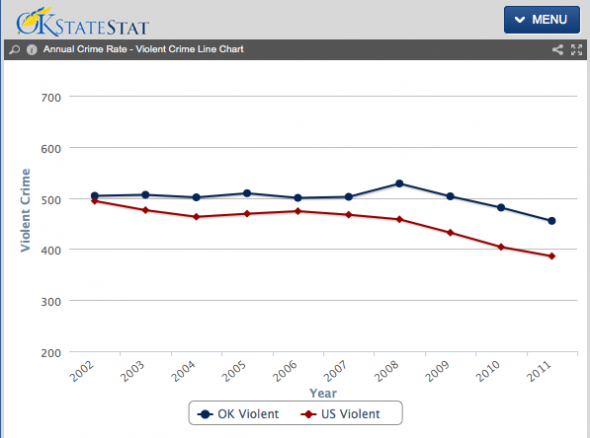 Here is a useful visual comparing Oklahoma’s violent crime rates to the national average since 2002. The sections of the country that are the most violent might be surprising. Wikipedia has a nice graphic showing the most violent states as of 2004. 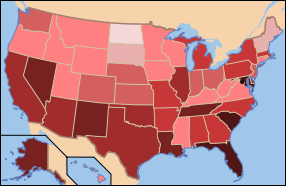 The states shaded in the lightest pink means under 100 violent crimes per 100,000 people were reported in 2004, while the states shaded with the darkest red indicates over 800 violent crimes per 100,000 people were reported. “But then why, once stable government did arrive, did it not lay claim to the monopoly on violence that is the very definition of government? The historian Pieter Spierenburg has suggested that “democracy came too soon to America,” namely, before the government had disarmed its citizens. Since American governance was more or less democratic from the start, the people could choose not to cede to it the safeguarding of their personal safety but to keep it as their prerogative. The unhappy result of this vigilante justice is that American homicide rates are far higher than those of Europe, and those of the South higher than those of the North. Oklahoma was one of the last states fully tamed by government, with only Alaska coming relatively later. Another book I’ve been reading through, “An Oklahoma I Had Never Seen Before,” is a progressive history of Oklahoma. It openly discusses how weak the territorial government had been in the decades prior to statehood, and how there was a time in Oklahoma’s pre-state history where a majority of the population were illegal settlers. These settlers would have not had the same level of recourse for government intervention in disputes as nearly everyone else in the country. One thing that hasn’t dropped as much in Oklahoma over the last few years is the murder rate. The number dropped from a high of 400 in 1995, the Murrah Building bombing accounts for 168 victims, down to around 200 a year in 2000, and has hovered around that number ever since. The murder rate in Oklahoma in 2010 was 5 victims per 100,000 people. 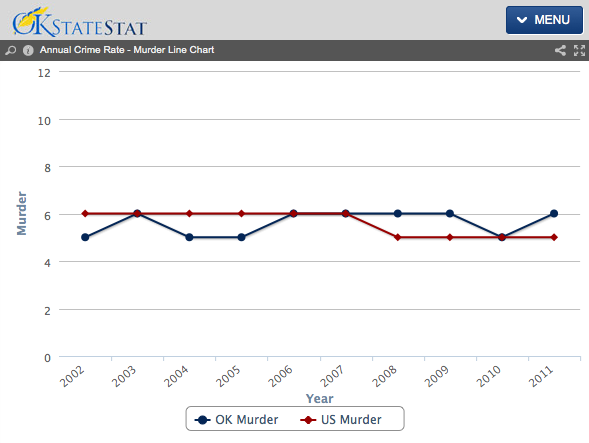 There is a very useful chart in the Performance Statistics section of ok.gov that shows that Oklahoma’s murder rate has either met or been above the national rate every year for the last decade. Comparing Oklahoma’s violent crime rate to some other states might also prove interesting. Remember, Oklahoma’s violent crime rate per 100,000 in 2010 was, by my count, 478. Compare that to New York’s at 391.3, and California’s at 413.3. Even Texas beats us, just barely though, with 450.6 incidents. Oklahoma doesn’t compare that well to any of the places we begrudgingly glance toward when trying to decide whether we’ve arrived. According to the arguments laid out by Steven Pinker, if Oklahoma lawmakers and leaders want to make this as safe a place to live as say, New York, they have to embrace role of government as the only legitimate use of force in settling disputes, encourage urbanization, and accept that government has a legitimate role to play in spreading the ideals of Enlightenment through education and rational inquiry. Unfortunately, we have a political climate right now where counter-Enlightenment groups like Oklahoma Conservative Political Action Committee (OCPAC) and the Oklahoma Tea Party have a disproportionate role to play in the state’s public discourse. For fun: Do you recognize the phrase “The Better Angels of Our Nature”? Here’s a hint: Abraham Lincoln. Tagged California, Comparing Oklahoma, Europe, Middle Ages, New York, OK, oklahoma, Performance Statistics, Pieter Spierenburg, seen, Steven Pinker, Texas, United States. Bookmark the permalink.